Take the pledge to stand with your union today! The rules have changed, but our commitment to our students hasn’t. 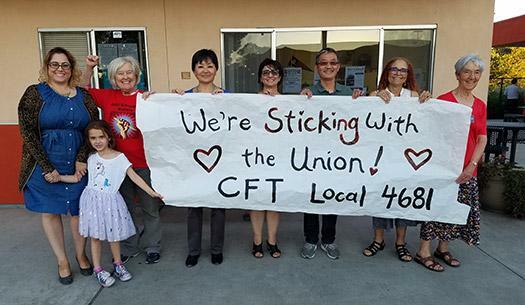 CFT members are fiercely dedicated to our students and their families because we believe in the power and promise of public education. We know that our profession, our schools, our colleges, and students are worth fighting for. As a union of educators and dedicated workers at public schools and colleges, we know that standing together is our best bet to ensure we have the pay and benefits that we need to serve our students well. It’s how we’ll win the policies and funding that truly support a quality education for every California student! Billionaires are waging a campaign to convince teachers, school workers, and other public sector employees that our best option is to go it alone. Their real aim is to limit our voice and our ability to advocate for the pay, benefits, and working conditions that we need to serve our students and their families. They aren’t looking out for us, and they’re not looking out for public education. Together, we can protect our profession, our schools and our students. It is up to us to stand together to make sure there is a strong voice for quality public education in California.